Why Skype for business contact center is a great fit? 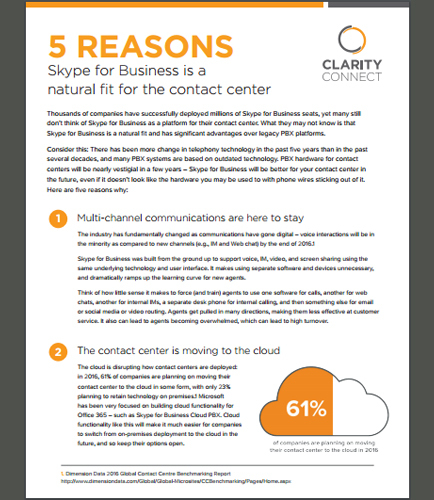 "Why Skype for business contact center is a great fit?" Past several decades showed nothing much of improvement in the technological perspective of the telephony technology. Though the presence of archaic PBX system still consumes a major part of market share, the present day Unified Communications however promises much more to offer with its major upheaval. PBX hardware for contact centers will be nearly vestigial in a few years – Skype for Business will be better for your contact center in the future, even if it doesn’t look like the hardware you may be used to with phone wires sticking out of it. Read this informative white paper on what you can accomplish with a Skype for Business contact center.